Ahh, bliss. Sand, sun, surf, and palm trees. Who doesn’t love the beach? I can almost hear the crashing of the waves over the city traffic, smell the salt despite the pollution, and feel myself relaxing as soon as I lay eyes on a beach scene. Unfortunately, I live many miles from the nearest picturesque shoreline and have to make do with bringing the beach into my house! Well, not quite like that, although it looks incredible (heated sand floors!). No, I don’t mean that I cover my floors with sand, turn on luau music, and spray ocean-inspired air freshener around the house. I’m not that desperate. But I do love to bring out summery home accents to brighten up my surroundings! Rather than permanently decorate in sunny colors and designs, I like to change up the décor at home according to the season so I feel the changing of the seasons inside and out. Here are some gorgeous rooms and accessories that can turn your home into a summer home – no second mortgage required. If you want to brighten your living or dining room but don’t have the budget (or desire) to paint the walls, buy special furniture, or re-carpet – just add some pillows and a beachy tableside lamp. 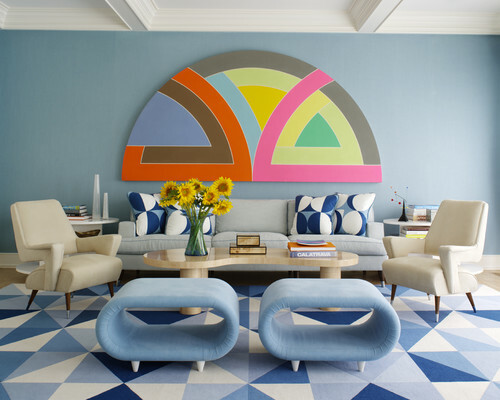 Artwork in bright colors – like the trendy color-blocked piece below – or featuring beach scenes completes the room and gives it a fresh new feel. The turquoise on those pillows is exquisite, and the lamp just screams “beach!” I’m drooling over the gorgeous use of color and modern furniture in the last living room. 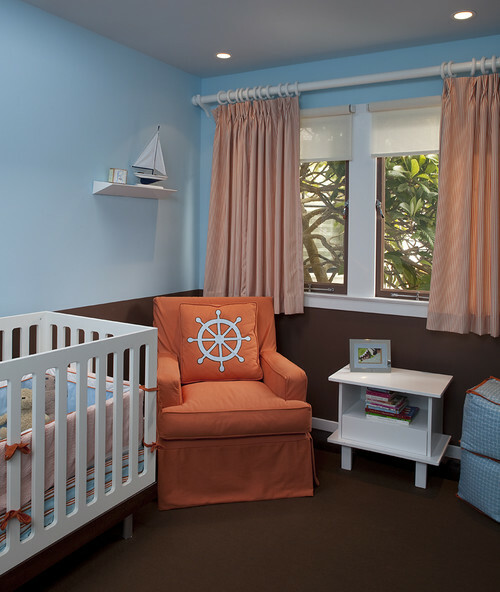 Make similar changes in bedrooms or incorporate nautical touches for a full summer-home experience. Whether your kitchen is minimalist, contemporary, traditional, or awaiting a remodel (no matter the style), it can be revitalized with cheery, colorful pieces like bowls or vases. Take advantage of the summer’s bounty and perk up your kitchen with fresh flowers and fruit in vibrant colors. Add a bright tablecloth, placemats, napkins, or window treatments and leave the blinds open for maximum feel-good sunlight. Bringing wicker furniture and other natural materials into your kitchen, dining area, or family room will give your house an outdoorsy, summery feel (even when it’s raining outside). 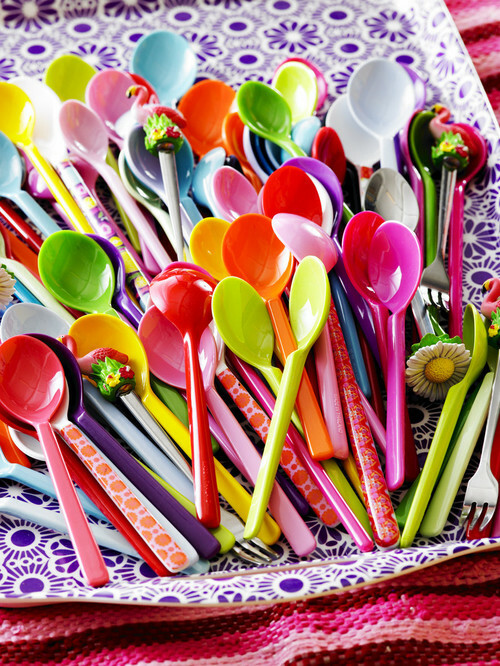 I love these vivid melamine spoons for summer dining – they’re a simple, low-cost upgrade to any table. Bathrooms are often neglected when it comes to redecorating. This bathroom is anything but! It’s decorated in plain white, with typical flooring and fittings. 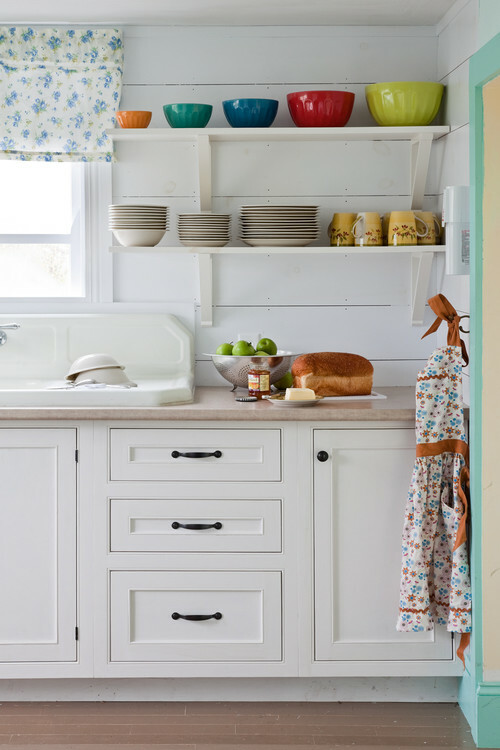 It bursts with color, however, with the easy addition of a bit of green on one wall and a fresh rug, towels, and shower curtain in warm, summery hues. 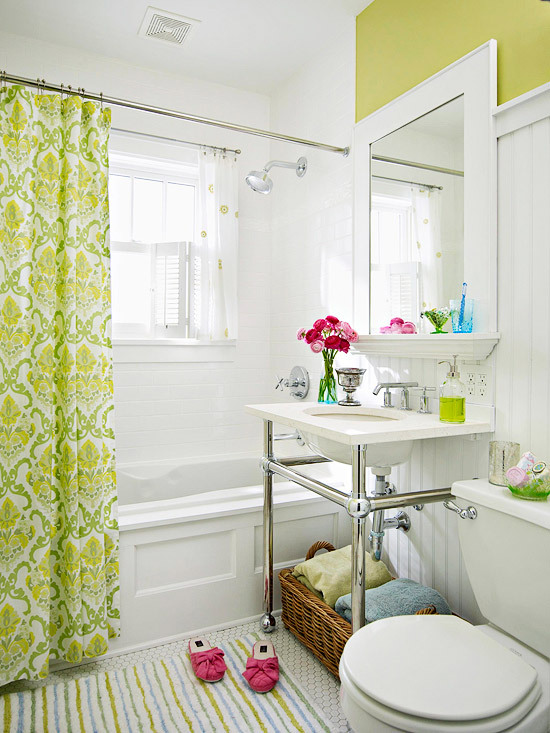 The wicker basket, bright soap, flowers, and toilet-top bowl instantly add a pop of smile-inducing color without overwhelming the space. If you have a summery home, I want to see it! How do you bring the beach in? Enjoy your summer – whether you spend it indoors or out!